TableTop Innovation would like to offer you a monthly supply of FREE paper placemats. TableTop Innovation is the very first community based advertising company that utilizes placemats as an advertising method. It covers Antipolo, Cainta and Marikina area. Your placemat will boldly feature your restaurants name in the center spot assuring you increased name recognition among your customers. You can feature anything you want in your “center stage”: menu, lunch specials, coupons, a picture of your restaurant, upcoming promos or events or simply your logo. The space is yours, and is always free to you. We will then offer remaining advertising space surrounding your “center stage” to non-competing local businesses. The placemat program is a proven method of connecting your fine restaurant with merchants and patrons in the local community since local advertisers and local businesses would also have copies of your placemat, ensuring increased name recognition. This is a "No Catch" program! We only want the food establishments to make sure the placemats are being used in their entirety because the local businesses who advertise are good customers and pay for the privilege to be seen at your establishment. Some of our partners in this great endeavor are Goodah!!! Marcos Highway; Charlie Wanton Special; Tamamangs Grill and Restaurant; Marikit-na Hapag Kainan; Viziato Carlos Bar and Restaurant; Ferro’s Grill KTV and Resto Bar; among others. We would like to invite you to be part of this wonderful opportunity. Our program is committed to the creation of a visual environment that's right for your customers. Once again, this is a “No Catch program” and the placemats will be given on a monthly basis for FREE. 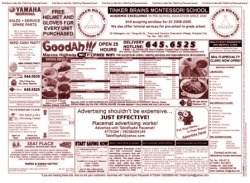 Should you be interested in receiving FREE paper placemats, you may reach us at 477.0384 / 0920.600.4149 / TableTopAd@yahoo.com, kindly look for Bernard or Emyl.